Students who have difficulty meeting the specific financial costs of attending college may be eligible for financial help from the Student Support Fund. This is a cash-limited fund available to help with travel costs, books, equipment and UK trips. Generally, households whose income is £25,000 or under are eligible to apply but special circumstances can be taken into consideration. Applications to the Support Fund can be made once you have enrolled at college. You are welcome to contact us to discuss this further. We also oversee the free college meals programme, and have a second hand bookshop that allows students to purchase and re-sell textbooks. Students’ attendance and academic record will be taken into account when applications for financial assistance are considered. Student Services can offer a private space in which you can discuss more personal matters. We can give advice on housing problems, childcare issues, or any situation that you are finding difficult to manage at college. Students who are looked after by the local authority, or who have a caring responsibility at home are able to receive specific support, should you wish. Speak to staff in Student Services at any time. 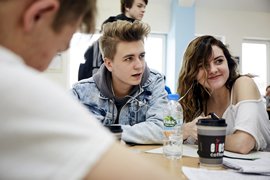 We also have The Hub which is an emotional health and well-being service at college. Students can come to the Hub to get advice on anything from sleep difficulties to specific mental health conditions. We also have a Counselling service based in college, as well as a sexual health clinic which is run once a week by an NHS practitioner. We are able to offer termly train passes at a discounted rate. More information will be available at your college interview and on the Welcome site once you have accepted your place, or you are welcome to contact staff in Student Services. We do not run our own bus services but we can advise on bus travel/timetables and purchasing season tickets with Stagecoach & Bluestar. We also look after Motorcycle parking permits and the Bicycle shelter/pods at college.